The holy grail of reverse transfer card printers. The XID8600 comes standard with the 600dpi ultra high resolution print head to allow increased on card security. It boasts the ability to print on multiple card formats, like PVC, ABS, PET, PC, ISO CR80 and even Smart Cards with an embedded chip, as well a whole range of options and features to ensure your card is as secure as possible. The available options for the XID8600 include magnetic stripe and/or contactless chip encoding, single or double sided lamination and the impressive Laser Engraving Unit that allows inline laser personalisation on demand. The card printer also comes standard double sided printing with USB and Ethernet connectivity for network connectivity. The XID8600 comes with our Card Printer Service Guarantee for your peace of mind. Click here for full details. The XID8600 with its 600dpi print resolution printhead makes the XID8600 one of the highest quality desktop card printers in the market. Combine with single or dual sided lamination to further increase to life and security of the printed card. - Ultra high 600dpi print resolution with micro-text. 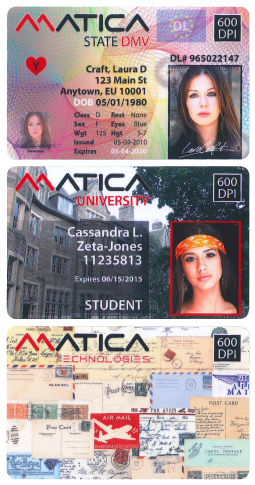 - Flexibility to create a high quality and highly secure double sided cards on demand.